ADAM-M, Other Misc. Product from RTS. RTS introduced the ADAM-M compact intercom matrix frame: The 3RU matrix frame supports eight interface cards, in addition to redundant master controllers. The ADAM-M is compatible with existing ADAM cards, including the new MADI-16+. When combined with the MADI-16+, the ADAM-M can be configured with up to 256 ports. In addition to MADI, users now have the option of configuring a very compact frame with AES, RVON, and Analog with full redundancy. These connectivity options are designed to save additional space and complexity by reducing the need for external cross connect panels, and simplifying wiring, the company says. The ADAM-M is designed to support the next generation of intercom technologies. The backplane architecture is designed to support higher performance I/O, and to be capable of supporting 1,000+ time slots for integration into full ADAM based systems. It also takes design cues from the CLD Series color display keypanels, which is designed to enhance the unified family look of RTS intercom components. The front panel is designed to provide system status at-a-glance, including card activity, power status, and cooling function. Since many users rely on RTS matrices in critical, always-on installations, all removable components of the ADAM-M have been made to be hot swappable. With the ADAM-M, installing a new master controller, replacing or maintaining cooling components, or even a power supply can be accomplished seamlessly with no interruption to the system. 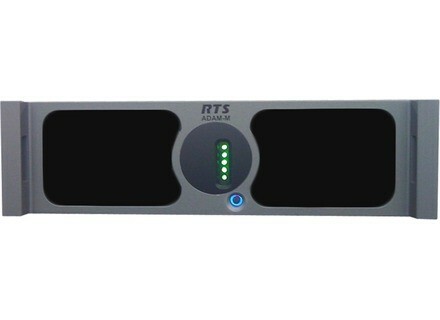 For further information, visit www.rtsintercoms.com. [Musikmesse] RTW 10600-PLUS RTW will showcase at this year's Prolight + Sound / Musikmesse show (Hall 9, Stand C25) products from the DigitalMonitor 10500 and SurroundMonitor 10600 series.